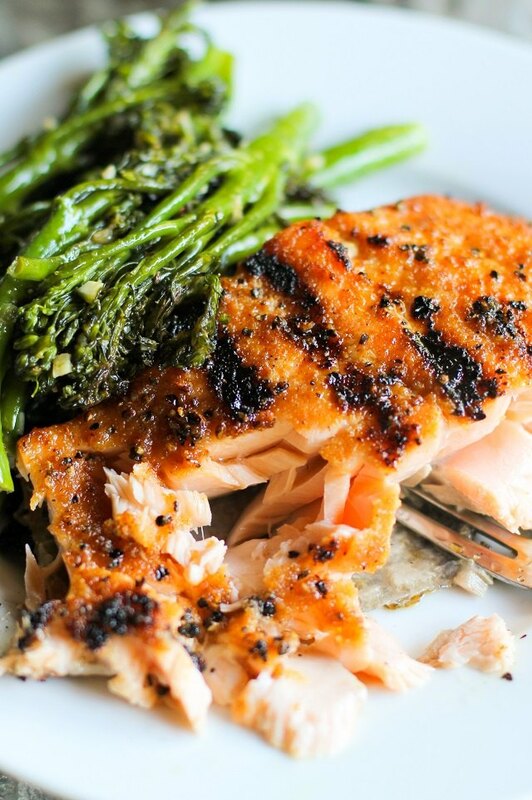 While not all types of fish are conducive to grilling (for example, tilapia and cod tend to flake and fall through the cracks), grilled salmon is a quick, easy, and delicious way of preparing the fish. In fact, salmon requires less time on the grill than most other meats, keeping your weekend grill out or weeknight dinner fast and hassle-free as well as healthy. Here are tips for foolproof grilling that results in a fabulous result each and every time. 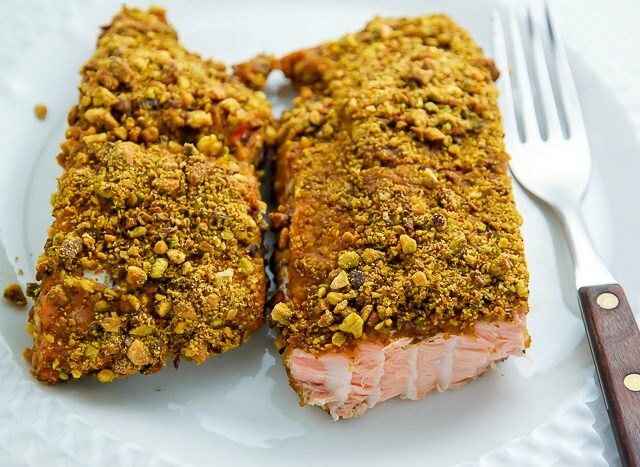 Place the salmon fillet on a plate or in a small casserole dish. Stir together all of the spices and sea salt in a small bowl. Drizzle the olive oil over the salmon fillet and use your hands to gently coat the flesh such that the whole surface is coated in oil. Sprinkle desired amount of spice rub over the fish, and allow it to sit at room temperature for 10 minutes. See note at the end of this article for spice blend and marinade ideas. Use a grill brush to brush off any particles of food left on the grill from your last barbecue. Spray or brush with oil -- this will prevent the fish from sticking to the grill. Preheat the grill to medium-high heat (about 400 to 500 degrees F) and keep the grill covered. 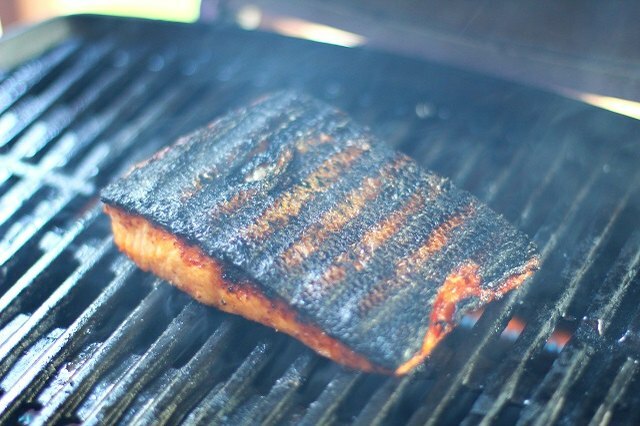 Note: you can use either a gas grill or a charcoal grill for grilling salmon. Place the salmon on the preheated grill skin-side down (Note: You can also grill the fish skin-side up, but grilling it skin-side down results in delicious, crispy skin). To avoid flare-ups, place the fillet between burners, so that as the salmon cooks, the fat doesn't drip on a flame and cause a burst of fire to cook the fish too quickly. Cook covered until the skin of the fish is charred, about 6 minutes, leaving the fish untouched. Carefully flip and continue cooking until grill marks appear on the flesh, about 2 minutes. 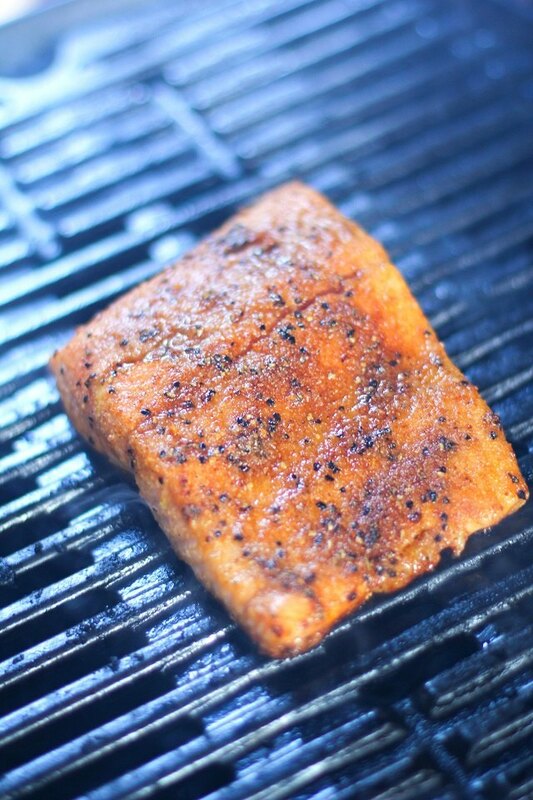 Note: a salmon fillet that is 1 inch thick or less requires about 8 minutes on the grill. For thicker fillets, cook the fish 10 to 12 minutes. For salmon that is rare in the center, cook 5 to 6 minutes total. 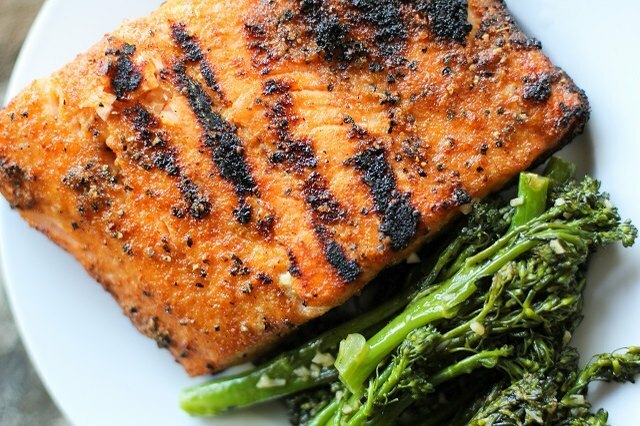 Serve grilled salmon with your choice of sauteed, roasted, or grilled vegetables. 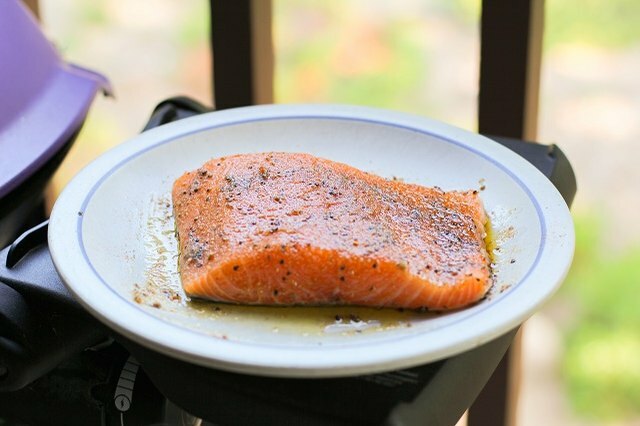 Because grilling itself lends a great deal of flavor to seafood, a good cut of salmon doesn't require a fancy marinade or a whole lot of spices. In fact, you can simply sprinkle the fish with sea salt and pepper and end up with a fantastic meal. 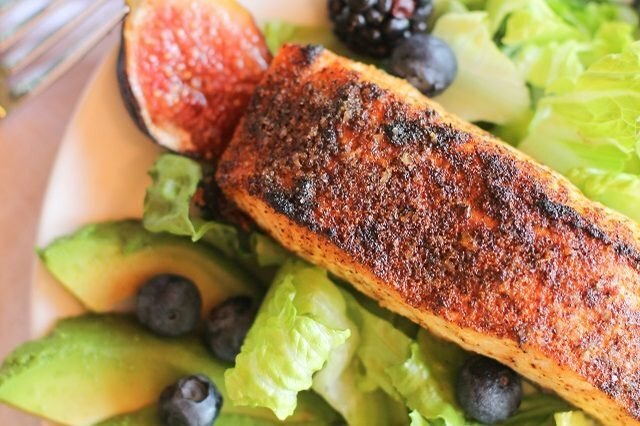 You can use your favorite store-bought or homemade spice blend of choice for grilling salmon. If making your own spice blend, consider incorporating onion powder, lemon pepper, ground coriander, and/or dried herbs. 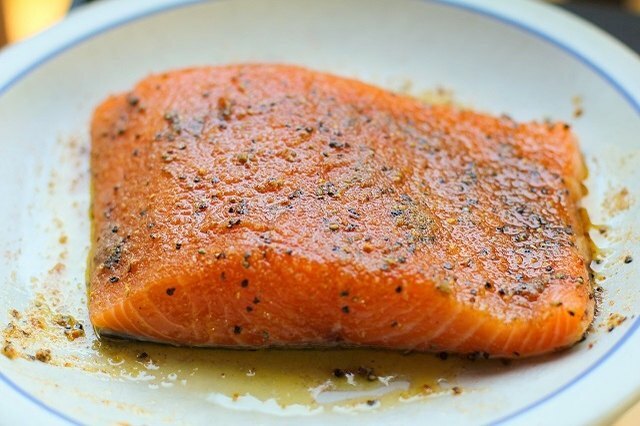 If you have some time to prepare the fish prior to grilling, you can marinate it for 2 to 12 hours in your favorite store-bought or homemade marinade. You can use lime or lemon juice for a marinade, just note that the acid from the juice will cook the fish. Only marinate the fish for about 15 minutes if using a marinade with lemon or lime juice. For a fantastic marinade, consider using white wine, soy sauce, olive oil, fresh grated ginger, garlic, and onion. To prepare a marinade, add all ingredients to a blender and blend until smooth. Place the salmon fillet in a sealable bag or container along with the marinade and allow it to sit for a few hours. When ready to grill, discard the marinade. 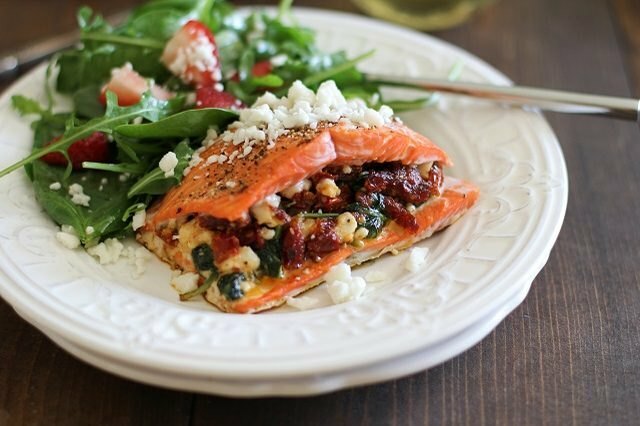 If you're like us and you just love salmon, trust us... you'll love these other ways of cooking everyone's favorite fish.